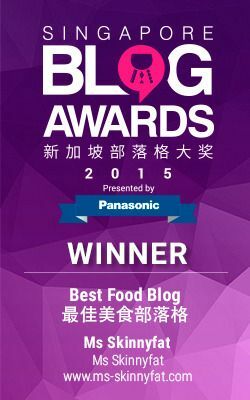 When it comes to French Toast, the most talked about one currently has got to be Miam Miam. With all the raving going on, I had to check it out for myself and French toast for dinner is always a good idea in Ms Skinnyfat's food world. 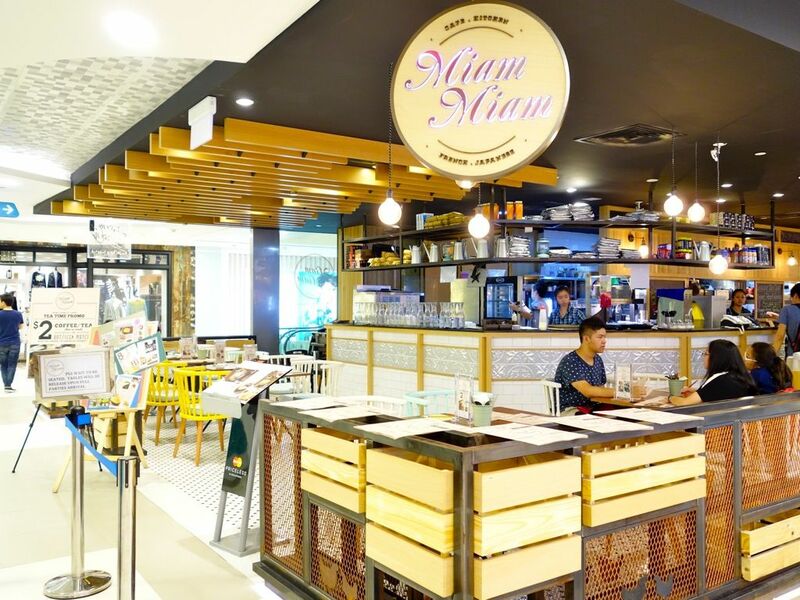 Miam Miam is a French-Japanese cafe and they serve the usual Fusion Japanese cafe stuff e.g. pasta, baked rice, soufflé, matcha latte and of course french toast. 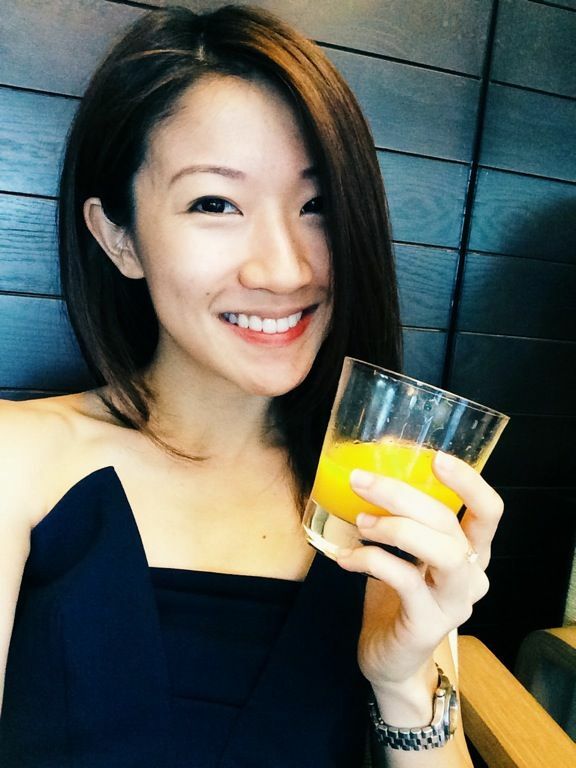 Knowing that they do not take reservations, we made it down early to the Bugis Junction outlet on a Friday evening and an empty restaurant welcomed us (but not for long). Drinks first, the Iced Matcha Latte with Softee ($8.80) was actually pretty decent. Great green tea flavor with a milky flavor, though I still prefer the intensity of Nana's Green Tea. 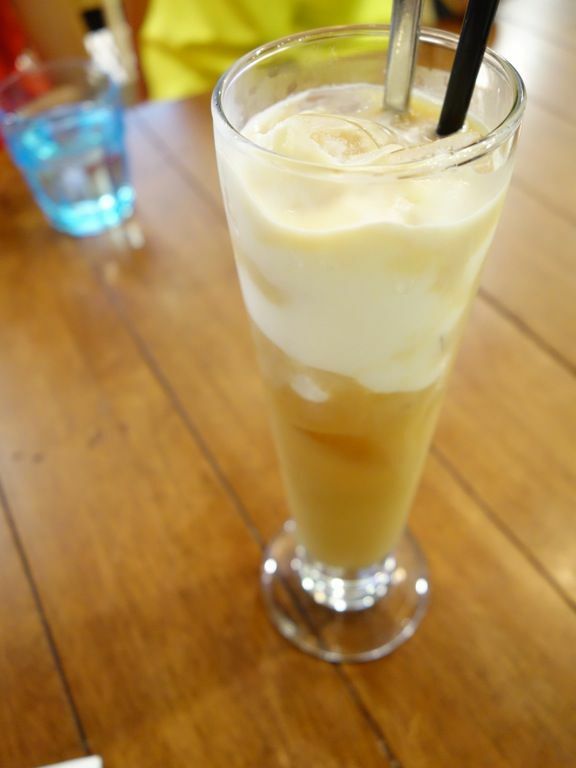 Iced Earl Grey with Softtee ($6.80) was bleah. The tea was too weak and the softee lacked in the cream department. Take note that water is charged at 50 cents a cup. Gave the other savory dishes a try as well. 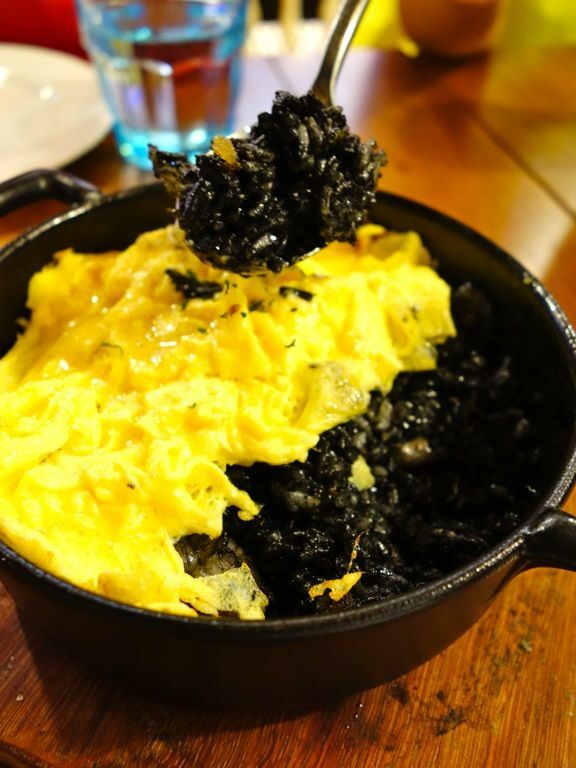 The Riz Noir ($15.80) is a Squid Ink Black Rice and Scrambled Omu Egg. The portion was surprisingly small though. A rather disappointing dish that lacked in smokiness. The rice while moist was also on the salty end. Eggs were nicely done though. The Miam Miam Spaghetti ($15.80) was typically Japanese with a light savory sauce made from French butter, shoyu and some secret sauce. Well, looking at the ingredients (processed sausage, bacon, some vegetables and mushrooms and a soft boiled egg), it seemed like a randomly thrown together plate of home cooked noodles and indeed it tasted kinda like that as well. Not to say that it's not nice but i would expect better ingredients. 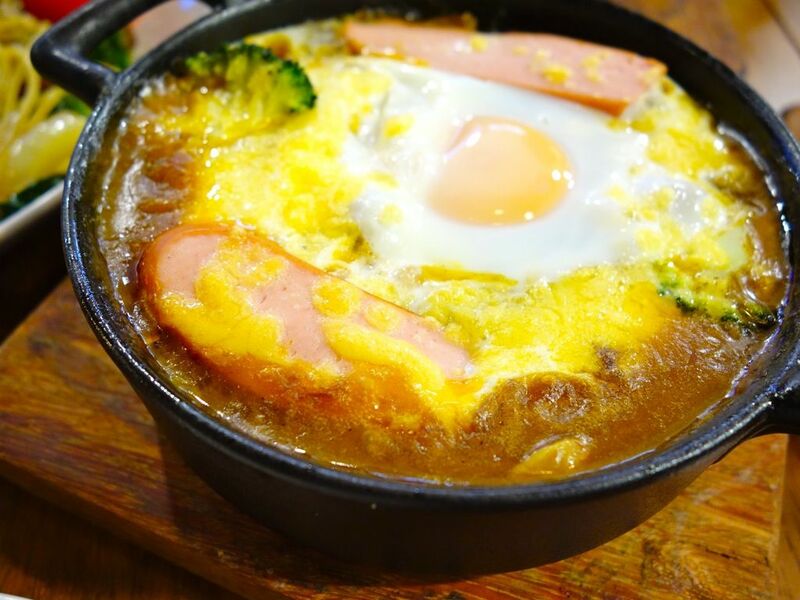 If you are a fan of saucy food, then the Riz Au Curry ($15.50) would be for you. 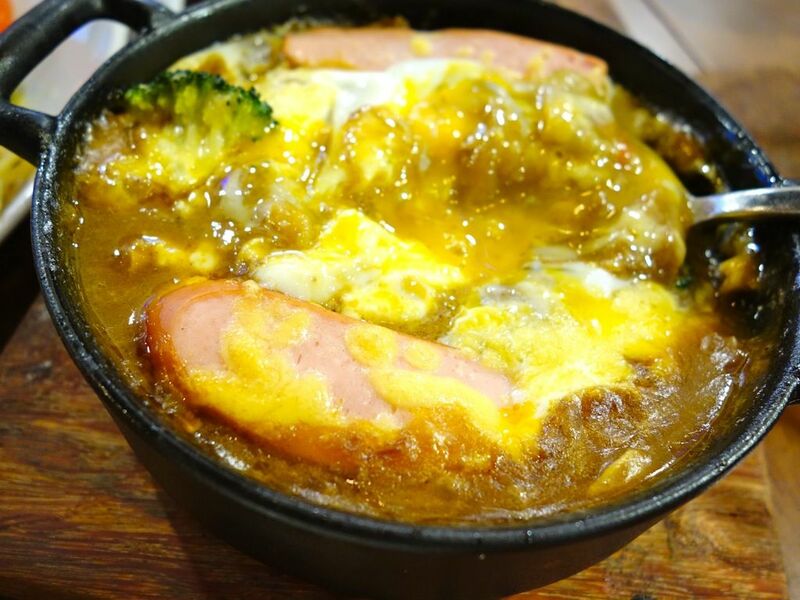 Sweetish rich Japanese curry with soft rice, minced meat (almost non-existent) pork sausages, broccoli cheese and egg. Everything kinda drowned in the curry. The flavor of the curry was alright but maybe just go easy on the sauce? Now the redeeming grace of Miam Miam would be their desserts and there are pancakes, souffles and parfaits. 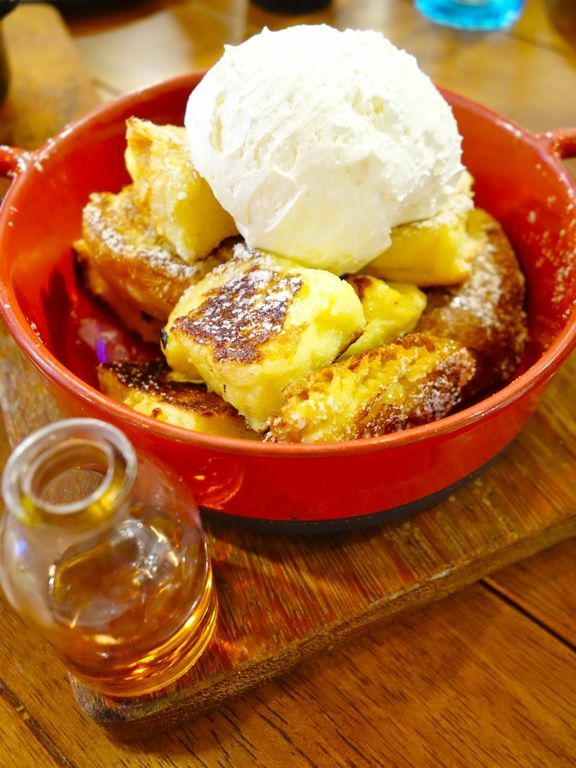 Honestly, there's one thing that you definitely should order and that's the French Toast. Disappointing mains aside, the French Toast ($9.80) was every bit as good as everyone promised. Soft fluffy brioche cubes that had the texture of clouds. They're paired with the thoroughly whipped heavy cream, it is close to clotted cream but lighter in taste (but sweeter) and texture. Absolutely delicious with the smoky maple syrup. I would have drenched the toast with it but there wasn't enough. Have this as a main course instead! 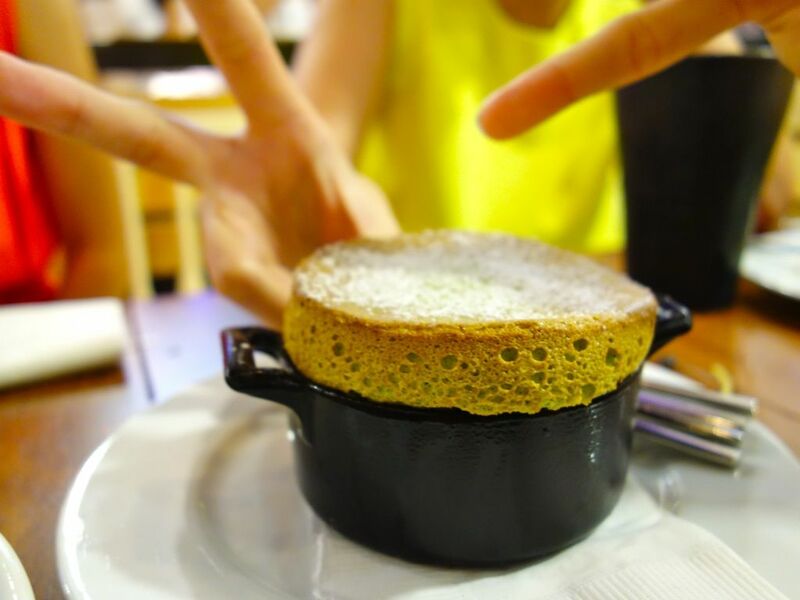 Matcha Souffle ($10.80) was undercooked and very wet inside. The texture is that of whipped raw egg whites that are pandan flavored. 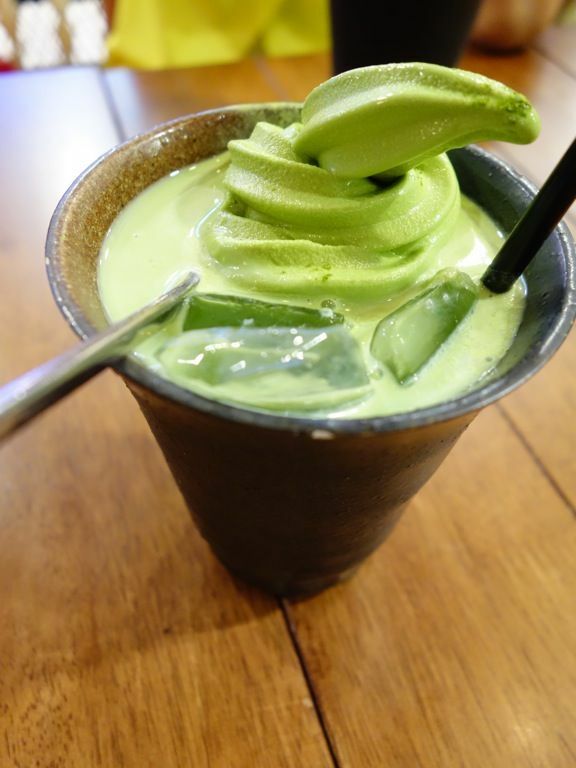 I could hardly taste any matcha. The Chocolate Molleaux Dessert ($9.80) fared better with the rich chocolate taste though i found it on the cakey end. The softee was too icy and lacked in vanilla. That said, i wouldn't mind having this again. Conclusion, Miam Miam is better for its sweets. The mains will fill you up but you wouldn't be quite satisfied. Maybe the pasta is alright. I don't know. But as for me, i'll stick with the French Toast and Matcha Latte for now. There's another outlet at West Gate, Jurong East Singapore.